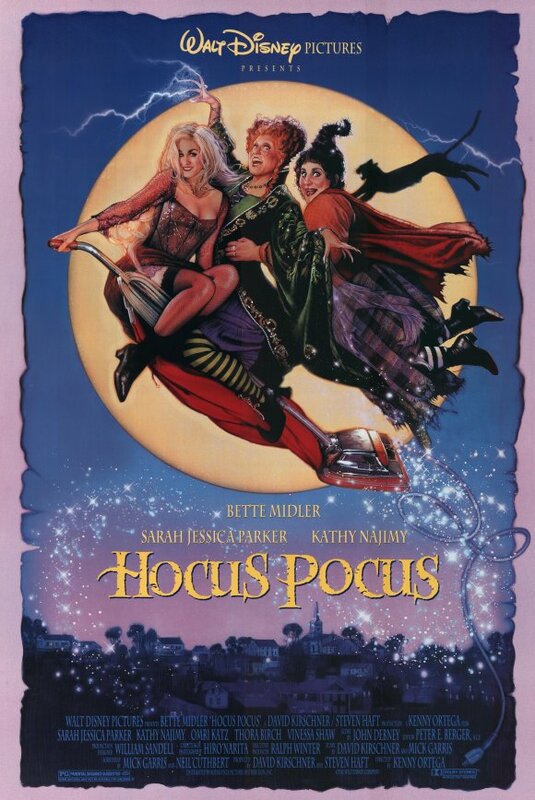 My choice for favorite “family friendly” horror movie is the 1993 PG-rated film Hocus Pocus. In the town of Salem, Washington there once lived three evil witch sisters. Winnie (Bette Midler), Sarah (Sarah Jessica Parker), and Mary Sanderson (Kathy Najimy). On one Halloween night, the sister lure one of the town’s children, Emily Binx, to their cottage, in hopes sucking the life out of her to gain back their youth. Emily’s older brother Thackery tries to come to her rescue, but in the end he is too late, and the sisters turned him into a black cat. The village people show up to the Sanderson house and ultimately hang the sisters, only after they vow to one day return for their revenge. 300 years later, Max Dennison (Omri Katz), and his family move to Salem. Max refuses to believe the stories he hears about the town. However, it is Halloween night, and after Max, his little sister Danni (Thora Birch), and Max’s crush Allison (Vinessa Shaw) visit the Sanderson house and end up resurrecting the 3 sisters, it is up to them, and the cat Binx to save the town’s children and put an end to these sisters once and for all. Hocus Pocus was one of my favorite films as a kid. I can’t go a Halloween without watching it to this day. The movie is filled with fun characters and great performances. The three actresses who play the Sanderson sisters work so well together and definitely have some great one-liners. This movie is very family friendly with some great comedy, while still keeping it in the horror genre. Who would have thought a film about witches killing children would be a family movie? Hands down the best part of the movie is when the three sisters sing “I Put A Spell On You” and end up putting the town’s adults into a dance frenzy. I swear that song gets stuck in my head every time I watch it, and anytime I start singing it around someone, they know exactly what movie it’s from. This film in my opinion, is the best family horror film out there. It provides enough fun for kids and adults, and is definitely one that all ‘90s kids know and will hopefully pass on to their kids or younger siblings. It’s a major classic in my book.